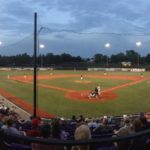 HARRISONBURG – When Chase Best climbed to the top of the mound, he did it with the intent to finish the game. The Covington left-hander, nearly exhausted was ready to fire his 114th pitch of the night. That fastball traveled with enough sting on it to trouble Harrisonburg’s Andrew Llewellyn, who foul tipped the pitch into the catcher’s mitt for strike three with the bases loaded in the bottom of the ninth to end the playoff contest at Veterans Memorial Park. The strikeout capped a complete game for Best and sent Covington to the Valley Baseball League semifinals with a 2- win over Harrisonburg in Game 2 of the best-of-three opening round series on Monday. Harrisonburg packed the bags with a leadoff single from Zach Little, a bung from Austin Embler, who reached via error, a successful sacrifice from Jack Wilson and an intentional walk to Elian Merejo. Between the walk and the next hitter, Covington manager Alex Kotheimer took a trip to visit his pitcher. Best, who plays his college ball at Lawson State and threw a seven-inning complete game against the Turks earlier this season, needed just three pitches to dispose of Brett Whelton ahead of retiring Llewellyn. The t-foot-4 rising sophomore struck out eight in total and yielded just six hits and two walks in the win. Best said it was his 95th inning of the year between his college season and his summer with the Lumberjacks. “I didn’t want to coach to come take me out of the game,” Best said. “It was my game and if we were going to lose it, it was going to be on me. Covington got both of its runs in the second inning – on an RBI single from Ryan Fitzgerald and the other on a swipe of home by Noah Bridges. Bridges broke for the plate when Turks starter Eli Ellington had Fitzgerald picked off of first. Bridges slid safely and just beat the throw for what turned out to be the game-winning run. For Wease and the Turks, it was a summer definited by close defeats. Harrisonburg, whih finished 20-22 in the regular season, suffered nine walk-off losses. Embler, a UNC-Greensboro rising senior infielder, has spent the last two summers playing for Wease. He said this year’s group remained competitive through the final out of it’s loss to Covington. “it’s been a great summer,” Embler said. “And it’s summer ball so you’re here to get better, improve your skills that you use at your school and take them back to apply them. Wease said he expects 11 players from this team to return in 2019. “We’re going to bring those guys back and see what happens,” Wease said. Best and Villa; Elington, Blomquist (7), Sutton (8), Bullinger (9) and Llwewllyn. WP – Best (1-0) LP – Ellington (0-1).